A new page from the comic that is included with the upcoming Jetfire and Jetstorm Entertainment Pack has surfaced and features the first public look at a colored Animated Red Alert. The new page can be seen by clicking on the image to the left. Ultra Magnus seems rather surprised in that last panel. As to Red Alert, I'll wait until I see real pictures or better yet, her in animation before I pass any kind of Judgement. Ok I'm confused, Red Alert? Remember back at the Armada days, when somebody called Wheeljack looked nothing like the original at all? Almost the same thing right now, except the new Red Alert still got the tool-hand from Armada Red Alert. Red Alert a GIRL!!!!!!!!!!!!!!!!!!! I now finally lost it. Were the rest of pics uploaded anywhere? Plus Ultra Magnus' expression looks pretty funny! I like her and of course I hope she gets a toy. Has anyone seen the rest of the scans? If so PM me please. And whoever answers this question better be very careful or you'll have me to answer to. Red Alert, a transsexual? Strange. Well, here's a characters I honestly thought wouldn't look so crappy…very disapointing. 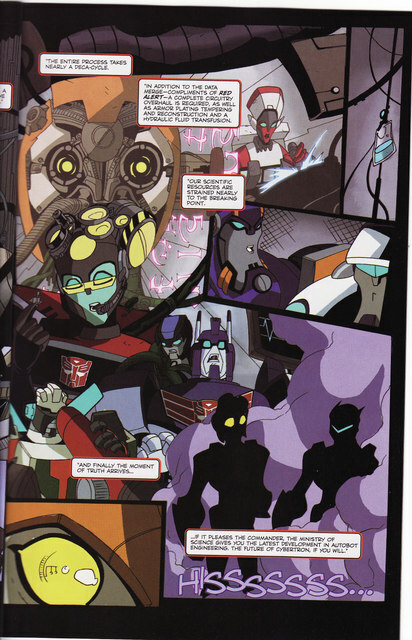 Wait, is Wheeljack looking down Perceptors…..tube? Wheeljack is looking into Percetpor's ocular lens and through his body/eyepiece tube. So.. yeah, I guess you're correct. i didn't say i didn't like the character… i just said she was UGLY! !